I chose these objects for their detail but also for a contrast between solid man-made objects and delicate natural structures. I used a dip pen and ink and a mop brush for the background. After looking at the work off David Maher, I decided that a good way of capturing the difference of these objects was by using different supports. I am really pleased with how the brown wrapping paper helps describe the copper vase but if I were to do it again I would also draw the cone on the same support as it doesn’t seem to fit in this drawing as it is. I like the way the lavender stalks and the dried ‘skeleton’ of the allium fills up the page. I tried to not worry about tone for this exercise but this raised the question of how to describe depth. 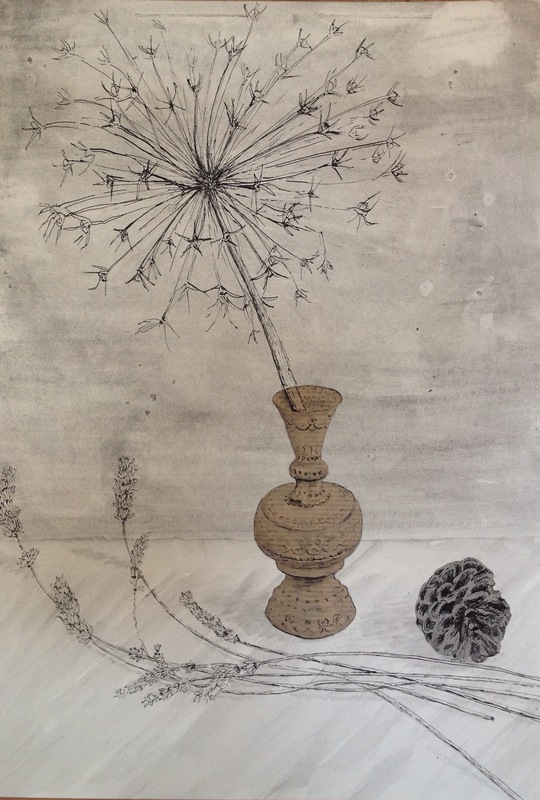 The allium and vase’s spherical shapes help give a sense of depth and the sweep of the lavender across the table adds to the drawings perspective. Next Article Project 2- Exercise 2 : Still life in tone using colour.